In case you missed them or don't have the time to read their own in-depth lowdown, here's a quick update on Schema Markup. Recap - What Are We Talking About? Just in case you're wondering what we're talking about, Schema Markup is extra code that you add into the backend of your site to help search engine spiders learn exactly what your site is about. It's a great way of making sure you get shown to the right type of searchers on the SERPs and increase the chances of being included in featured snippets, answer cards and thumbnail results. It's basically a means of getting more from your SEO. Especially as it incrementally helps with click through rates and helps to boost your authority. Which, in turn, also helps your inbound marketing efforts: the more people who see you, the more people will click through to your content; the more people who do that, the more leads you will... you get the idea. There's a whole list of agreed terms which the big search engine providers and the Schema community have agreed on warrant extra information and explanation on the backend in order to maximise the user experience of search engines. Learn how to implement Schema into your website. 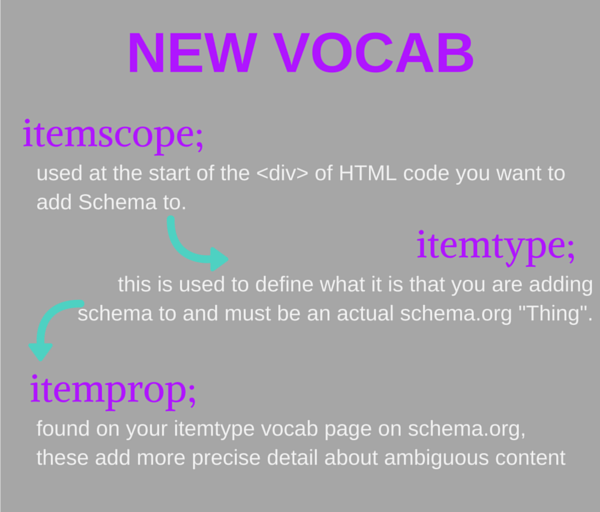 Some useful schema related vocabulary and terminology. An extract from this blog post. Summer 2016 saw a couple of Schema updates: 3.0 and 3.1. The launch of meta.schema.org the extension of the standard schema site contains terms primarily designed to aid installation of the original schema vocabulary. The launch of pending.schema.org which is a place where work-in-progress terms which have yet to be accepted into the core vocabulary are placed. They aren't all guaranteed to become proper schema vocabulary, but this is a handy database to crib from. The launch of health-lifesci.schema.org is a new home for schema's existing Medical and healthcare related terms, as well as potential future collaborative work relating to that sector. It's the second of these new extensions we think is most interesting. We have advocated in the past trying to get a heads up on Schema if you don't operate within the already used sectors (events, ticket sales, near-me-searcher targeting, retail), and this pending. extension facilitates this even further. It's also further proof that Schema is expanding into general use. "disambiguatingDescription" was added to the Schema vocabulary, which is a quick way to highlight the parts of your content which are handy and brief explanations. This is another way of targeting answer card places because it spells out to search engines that "this bit is a quick and easy explanation!" 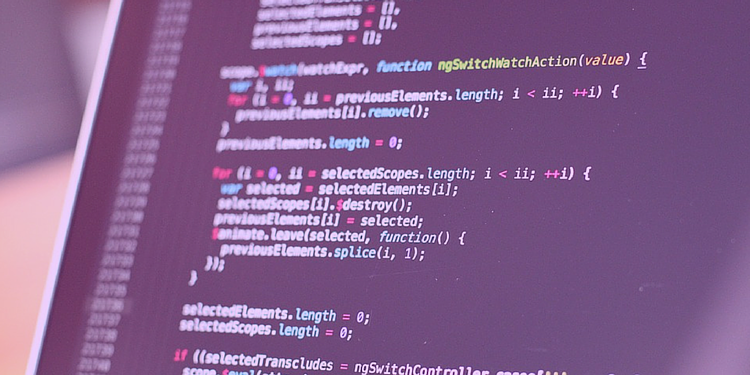 "ComputerLanguage" and "programmingLanguage" were added, leaving "Languages" to be used for solely regular language and translation services. And there were other split-downs like this. "Message" and "Conversations" are two new types of "CreativeWork" - we hope there are further specifics of types of creative work that you can include in the future. "suitableForDiet" and "RestrictedDiet" were added to the "Recipes" field. This is a good example of how Schema is aiming to improve user experience. And in August we saw 3.1 put live. This primarily focused on updating the hotel/accommodation vocabulary to allow more specifics, fixed some bugs and added to the schema.org site in order to keep improving it. Those working in the hotel and accommodation industry can now markup their review ratings, amongst other things, to showcase and highlight them to the search engines. Importantly for inbound marketing purposes, "isAccessibleForFree" is now expected to be potentially included, by Schema, on "CreativeWork" and "Event" markups. Hopefully they will keep expanding and splitting down the vocabulary to open up more and more options to make sure you can get ahead of your competitors by boosting your SEO with Schema. SEO is just one part of a wider inbound strategy. To get ahead in PPC, content, email marketing and more, check out our free ebook filled with helpful ideas and advice.